Buy fewer (and better) things. Store like with like. Get rid of the plastic. Display—don’t stash—your belongings. Let go of your inner perfectionist and remember that rooms are for living. 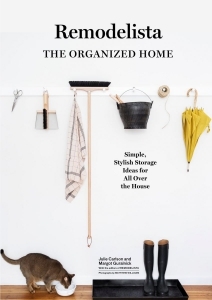 These are a few of the central principles behind Remodelista: The Organized Home, the new book from the team behind the inspirational design site Remodelista.com. Whether you’re a minimalist or someone who takes pleasure in her collections, we all yearn for an unencumbered life in a home that makes us happy. This compact tome shows us how, with more than 100 simple and stylish tips, each clearly presented and accompanied by full-colour photographs that are sure to inspire. Readers will learn strategies for conquering their homes’ problem zones (from the medicine cabinet to the bedroom closet) and organizing tricks and tools that can be deployed in every room (embrace trays; hunt for unused spaces overhead; decant everything). Interviews with experts, ranging from kindergarten teachers to hoteliers, offer even more ingenious ideas to steal. It all adds up to the ultimate home organizing manual.